Color(s): Black and tan with white markings, golden red. The oldest of the Pariah Dogs, this breed is extremely primitive and the subject of much debate. Scientists believe they are not truly domesticated animals. Today, wild populations are thought to be extinct, with limited specimens being kept in zoos or by fanciers. New Guinea Singing Dog's are considered rare and difficult to obtain. The New Guinea Singing Dog has a fox-like appearance and is noted for their unique vocalization. They are extremely agile and have the ability to climb and jump like a cat. This breed is well-balanced, hardy, graceful, and alert. The New Guinea Singing Dog breed is lively and curious but does not typically form close attachments to human pack members. They are not recommended as housepets or companions. They are aloof and have an exceedingly high prey drive. They do not do well in homes with children, dogs, or other household pets. Daily brushing is required. New Guinea Singing Dog's rarely need bathing as they are naturally clean. Due to the rarity of this breed there are no known health issues. 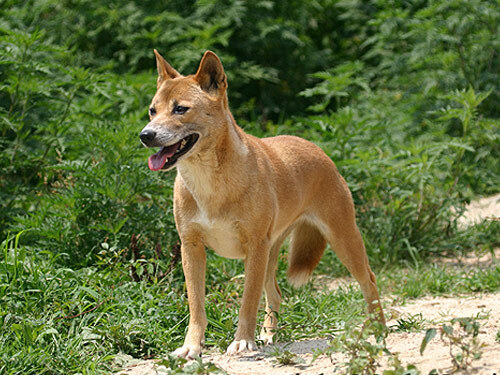 A double coat breed, the New Guinea Singing Dog has an outer coat that is straight, short, and crisp to the touch. The under coat is felt-like in texture and very dense. The intensity of the New Guinea Singing Dog makes training very difficult. Early socialization is recommended and must be done with respect, fairness, consistency, and with full understanding and knowledge of this primitive breed. The New Guinea Singing Dog is active and requires an inordinate amount of mental stimulation. They will become destructive if bored. They excel at escape, so yards must be extremely well enclosed both in heighth and depth.